If Mother Nature doesn’t provide rain on request, it’s up to you to water your lawn to keep it green. A beautiful lawn needs fertilizer and water to maintain its looks and lush growth. Too often proper watering is overlooked by homeowners. Winnipeg lawns require about two hours of watering per week for moisture to penetrate to the proper depth. Early morning watering is best, when evaporation from heat and wind is low. Raise your mowing height to shade the soil and reduce evaporation. Keep foot traffic to a minimum to avoid damaging stressed grass. Toasty temperatures and long summer days can make you want to skip the yard work and just enjoy the landscape you have. But the summer months can take a real toll on your landscape. Thankfully, there are some simple summer tasks that can help maintain the beauty of your landscape. The experts at Eco Green offer these simple strategies for minimizing heat and moisture stress while also limiting insect and disease problems. Weekly watering is the single most important thing you can do to keep your lawn green and healthy this summer. Keeping a lawn green requires 1-2″ of water each week. Without it the lawn will begin to look patchy, dull, and brown. So if your lawn is not looking its best, start by watering! Hot humid weather, especially warm humid evenings are the perfect conditions for disease problems to affect lawns. Watering during the evening can compound the problem and encourage the development of diseases. When possible water during the morning so that the grass blades can dry out before the evening. You can conserve moisture by not mowing your lawn during the heat of the day when the freshly cut blades release moisture rapidly and can turn brown. Sharp mower blades create a clean cut that heals quickly vs. the torn grass blades and brown frayed tips that come along with a dull mower blade. You can also conserve moisture by not mowing too short. 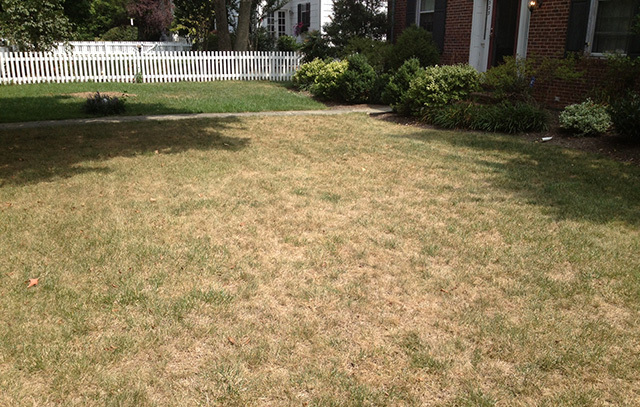 Closely cut lawns expose the soil to the sun and increase the rate of evaporation causing your lawn to dry out faster. Chinch bugs feeding on the lawn can cause damage giving the lawn a dry patchy appearance. If watering and proper mowing haven’t improved the lawn you may have a bug problem and an insect control treatment may be required to kill the bugs. So this summer help your lawn beat the heat!